If you have headaches then spinal manipulation or chiropractic adjustments can be an appropriate form of treatment for you. 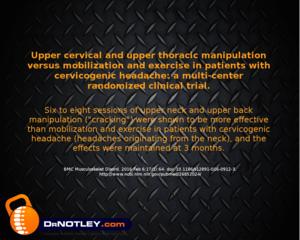 In the following research paper you will see that spinal manipulation was more effective for reducing headaches than mobilization. You should also note that a long course of treatment was not necessary. Six to eight visits were performed to show significant effects. Exercises were not performed by those who received manipulation. You should note that there are other papers that indicate that manipulation and exercise is more effective than with manipulation alone. Here is the abstract. You can find the full version through the link.